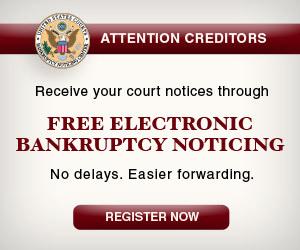 Welcome to the Creditors section of the Court's Web site. Here you will find information pertinent to you and your business with the Court. You are a person or institution to whom a debtor owes money or claims that a debtor owes you money. You have received a notice from the court about a particular bankruptcy case whereby the debtor has listed you as someone to whom the debtor owes money or may owe money. If you are aware of bankruptcy fraud, please report it.